With his debut effort, Get Out, Jordan Peele proved himself a master of making entirely ordinary situations off-putting and horrific. He successfully employs this skill the exact second Adelaide and her family set foot in Santa Cruz. It doesn’t help that beforehand, the family witnesses a man being loaded into an ambulance – apparently having been stabbed to death. Jason wanders off, but because she recalls her traumatic encounter with her doppelgänger, she saves him before anything results from it. Even before Adelaide ended up in the funhouse in 1986, you see an unkempt person holding up a sign reading “Jeremiah 11:11”, referring to a passage in the bible. Though not completely unheard of in real life, someone resembling a homeless person holding up a sign alluding to such a specific phrase is highly bizarre. It’s as though he knows something is about to happen. What, exactly, is about to happen is not obvious in the slightest, however. The audience is subjected to a lot of uneasy shots, yet the danger lurking beneath the surface doesn’t have a form. The most significant turning point occurs that night in the Wilsons’ summer home when, appropriately enough, the clock strikes 11:11 PM. The power goes out and Gabe espies what appears to be a family of four in the driveway. Though they initially stand still, Gabe, after hearing of Adelaide’s story, decides to play it safe and call the police. It is when he attempts to intimidate them that they begin to mobilize. These figures turn out to be abnormally strong, easily breaking into the Wilsons’ summer home. After having them exactly where they want them, the family reveals their faces to the Wilsons. Just like Adelaide three decades prior, they find themselves staring at perfect replicas. Taking the “they’re their own worst enemy” adage to its most literal extreme, the Wilsons and their corresponding doubles are played by the same actors and actresses. This is the exact moment you begin to realize just how creative Us truly is. Getting a good performance out of a single actor is difficult enough. They need to go a step beyond merely knowing their character inside and out – they need to become their part. What Mr. Peele asked of his crew was to transform themselves again and again right before the viewers’ eyes. They had to do this without letting them to spot the thread, thus spoiling the illusion. I can say beyond any shadow of a doubt that they succeeded. 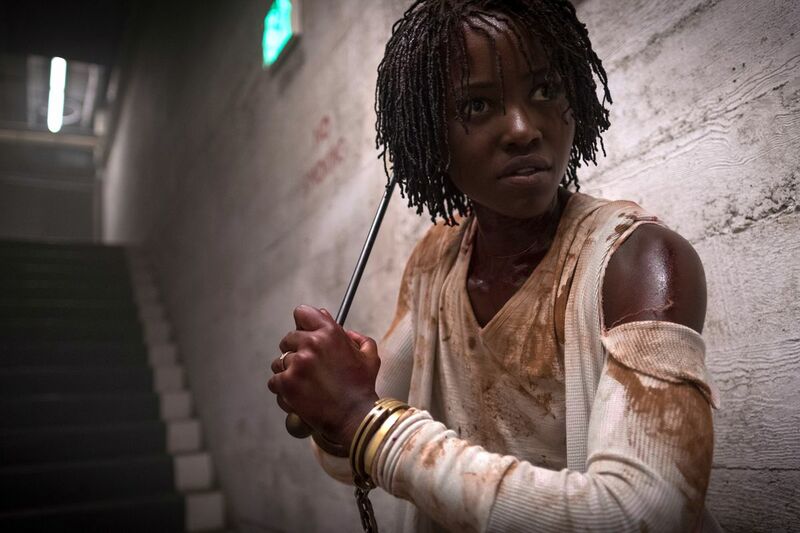 One minute, you’re afraid of Lupita Nyong’o; the next, you’re afraid for her life. It’s a remarkable feat when you can get a seasoned voice actor to convincingly play two different roles. Getting a live-action actor to do the same is a skill even master directors don’t have. Despite being their exact doubles, it is clear Red’s life is far less idyllic than Adelaide’s. While Adelaide is perfectly happy with her family, Red makes it clear she doesn’t love her own husband, Abraham, and sees her children, Umbrae and Pluto, as monsters for the trauma they put her through. Red is the only one of these family members capable of speech. Abraham and Pluto exhibit many animalistic mannerisms while Umbrae’s demeanor resembles that of a slasher film villain – albeit more prone to manic laughter than the likes of Michael Myers or Jason Voorhees. It’s also clear that all four of them are not of a sound mind, for despite having the upper hand, they do not kill off the Wilsons immediately. It could lead one to believe their plan is a little deeper than that, but after telling them all they need to know, they drop the pretenses and strike. It’s inherently strange to see someone who looks exactly like yourself wandering around. It’s another thing entirely for that identical stranger to want nothing more than to erase you from existence. Bringing to mind the words of the funhouse, “find yourself”, you would be up against an enemy that essentially is you. You would wonder if you could possibly catch such a threat off-guard. Though the 2010s had been a stellar decade for horror, one of the bigger weaknesses with the genre at the time was that the films often boasted horribly unlikable casts. In the worst examples, the audience found themselves waiting for the killer to pick them off one-by-one. This problem with this approach is obvious. If the audience doesn’t care what happens to the cast, why bother making a story about them at all? Even if they’re boors set up for the slaughterhouse, it doesn’t change that you have to spend a significant portion of the film’s runtime with them. To be fair, this propensity was usually the mark of a bad horror film. However, the trend also reared its ugly head in films such as You’re Next or Hereditary, proving even critical darlings couldn’t help but be affected by the worst aspects of the era’s zeitgeist. I am pleased to say that, like Get Out, Us completely averts this problem. You get to spend a lot of time with this family before the plot gets out of hand. It’s almost to the point where if one ignored the music and certain shots, they could mistake Us for a sitcom aimed for a more mature audience. Commendably, Mr. Peele does an excellent job putting unique spins on the tropes associated with that genre as well. Gabe brings to mind the archetypical bumbling father popularized by characters such as Homer Simpson. Meanwhile, his children, Zora and Jason, are the typical sassy teenage daughter and strange kid respectively. At the same time, while they are cast from recognizable character molds, they’re not defined by them. Gabe knows when to drop the humor and get serious. In most films, the comic relief is mere cannon fodder; in Us, he is the first to kill his doppelgänger. For their part, Zora and Jason prove very clever when it comes to outwitting their own doppelgängers, easily evading them. Shortly after losing their assailants, the Wilsons try to get help from their neighbors, the Tyler family, and it is here you learn the full extent of what is going on. The Tylers form an interesting dynamic with the Wilsons. You can tell the Tylers are richer than the Wilsons, yet their wealth have not afforded them more happiness. Josh Tyler has an incredibly contentious relationship with Kitty. When the power goes out, he isn’t willing to lift a finger to search for potential intruders. This apathy proves lethal when four oddly familiar people descend upon the domicile, systematically killing off the residents. These implications mean exactly what you think; the Wilsons aren’t the only ones with doppelgängers. When the Wilsons arrive on the scene and kill off the Tylers’ doppelgängers, they learn, to their horror, that their story is unfolding all across the nation. By this point, it becomes clear that as a horror film, Us was clearly conceived by someone who enjoyed the genre, yet could suffer its clichés no longer. Consequently, very few associated tropes are played straight. In most films, the Tylers would be a dime-a-dozen group of combative dullards killed off in a cathartic fashion by the killer. The Tylers certainly aren’t endearing and there is a layer of black comedy to be found in how the voice-activated Alexa analogue misinterprets Kitty’s attempts to call the police, instead playing a certain famous N.W.A. song. At the same time, the nature of their deaths makes it difficult to cheer. In the few scenes in which they interact with the Wilsons, they’re shown to be fairly amiable towards them. Moreover, while their marriage is depicted as highly tenuous, Kitty’s last act after being mortally wounded is to try to crawl toward her husband. It’s also a standard horror trope that the police are useless. On some level it makes sense; it’s meant to place the onus on the main characters to solve whatever problem is plaguing them. Having the central focus evade a serial killer only for the police show up out of nowhere and arrest the latter would be anticlimactic from a narrative standpoint. Despite this, many creators over the years stretched the trope to unbelievable degrees. In extreme cases, even adding supernatural elements failed to justify their ineptitude. Us manages to provide an excellent reason as to why the police don’t bother showing up after the Wilsons call them; they’re entirely overwhelmed. Even in the unlikely event that they themselves have no doppelgängers, it would be impossible for them to respond to every single call in this situation. Finally, what makes these four characters such great horror film protagonists is the sheer amount of common sense they possess. These are not the kinds of characters who run upstairs when a killer is loose or split up at the first opportunity. Zora and Jason only go upstairs in order to save their mother – and even then, they don’t do so until they have weapons. You get the sense that these characters saw many horror films apiece and know exactly what they have to do to survive. It’s highly amusing when they get the hang of things and Zora insists she has the highest kill count only for her claim to be contested by Gabe, who had killed his own doppelgänger and Josh’s by that point. The final act is started when Red kidnaps Jason. Gabe has been severely injured, forcing Zora to look after him. Appropriately, Adelaide is forced to enter the funhouse in which she encountered Red for the first time as a child. She discovers an underground facility almost completely empty save for a sizable population of rabbits. It is here that Red informs Adelaide exactly how they came into being. The United States government had created clones of ordinary citizens in an attempt to control the public. However, the experiment was a failure, and the clones were subsequently abandoned. Furthermore, in a development nobody could have predicted, cloning humans results in two beings sharing the same soul. Generations of these people, the Tethered, have lived their lives underground, endlessly mimicking their aboveground counterparts. It’s a hollow, maddening existence; they laugh, cry, and dance, yet none of these actions are theirs. The laughs are mirthless, the tears dry, and the dances spiritless. This is where someone familiar with the bible would realize why Jeremiah 11:11 was frequently referenced throughout. The disaster and suffering refers to the Tethered’s plight. The very nature of their being ensured they couldn’t escape the underground facility. The Tethered can make all of the noise they want, but those in charge of the experiment removed all evidence of it ever happening, thus ensuring nobody will save them. Adelaide and Red meeting disrupted this relationship, setting off a chain reaction that allowed the Tethered to break free; what the government ignored all of these years can no longer be contained. When the Tethered invade, the passage becomes relevant once more. Now, the Tethered are making their ordinary counterparts suffer, completely deaf to the tears of their victims. Even the number of the passage, 11, has a meaning, resembling two identical bodies. From that, 11:11 would represent a family of four – just like what accosted the Wilsons. Following a fierce battle, Adelaide impales Red and rescues Jason. However, this is where the film reveals its ultimate deception. In truth, Adelaide never saw her family again. Adelaide’s doppelgänger took her place on the surface world and trapped her in the underground facility. Red had gone insane and was trying to take back everything the Adelaide we’ve been following stole from her. Though this twist ending may seem as though it comes out of nowhere, it’s actually foreshadowed brilliantly. Red was the only one of the Tethered capable of speech and even then, she spoke in a raspy voice. Every word she spoke made it sound as though she was in complete agony. Unlike the feral people she was surrounded by for most of her life, she could talk, but her voice had long atrophied by the time she enacted her revolution. You also learn that the Tethered’s goal is to kill their surface selves and form a human chain stretching from coast to coast. The chances of someone who lived underground all of her life knowing about the Hands Across America charity event that occurred on May 25, 1986 or come up with such an oddly specific idea independently are infinitesimal. With this new information, it makes perfect sense; one of Adelaide’s last memories before being trapped underground was watching a commercial for the event. She then uses her last memory in an effort to let the world know of the injustice inflicted upon the Tethered. What I especially enjoy about the twist is its nature versus nurture theme. Those in charge of the conspiracy believed the Tethered were just shadows of the originals. The Adelaide the audience has come to know is one of the Tethered, yet she learned to speak, gained agency, and formed functioning relationships – even managing to outpace Kitty in the latter field. She does lapse back into a more feral state when hunting down Red, but reverts back to normal once Jason is safe. It works the other way around as well. Red, despite being forced to live in squalid conditions after a brief, happy life on the surface, retains all of her childhood memories and uses her voice to inspire a revolution. More than anything, what I like about this ending is that it’s impactful, yet not overbearing. The narrative tells you everything you need to know and lets you draw your own conclusions. Is this Adelaide a bad person for what she did or was her defining act born from sheer desperation? Based on what she does throughout the film, she only truly seems interested in keeping her family safe, but it’s impossible to know for sure. When examining the most critically acclaimed films from this time period, whether it’s Spike Lee’s BlacKkKlansman or Paul Schrader’s First Reformed, you get these heavy-handed parables that leave no room for interpretation. There’s no point in striking up conversations about these films; the directors decided what you should talk about for you. Us could be considered an allegory for class discrepancy, bringing to mind the quote attributed to Jean-Jacques Rousseau, “When the people shall have nothing more to eat, they will eat the rich,” in how meticulous the Tethered are in replacing their original selves. Whereas Mr. Lee and Mr. Schrader haphazardly wrote a story around their central messages, Mr. Peele elected for the opposite approach. He weaved a solid narrative first and allowed any underlying implications to form messages for him. It was exceptionally rare to see a film director in the late 2010s put this much faith in their audience, making Us all the more admirable. One reoccurring trend when it comes to parsing fiction is the concept of the sophomore jinx. It is exactly what it implies; an artist makes a thunderous debut only for their follow-up to be complete disappointment. This isn’t a case in which the critics failed to recognize a masterpiece either; the work in question is legitimately bad – or at least flawed enough that it will not receive any kind of retroactive vindication. This could occur for a variety of reasons. Maybe the artist let the success go to their head. Perhaps they were nervous about following up such a monumental work. I find the director most likely to fall victim to the sophomore jinx is the one who has precisely one good idea. They make a great impression with their debut only for them to retread ground in their subsequent work – often less coherently and more angrily. Shortly after Us debuted, one journalist felt Mr. Peele managed to avoid the pitfall known as sophomore jinx. I can confirm whoever wrote that is entirely correct because Us is one of the most creative films of its era. A lot of what made Get Out so great can be found in Us; in both films, Mr. Peele was a master of creating an unsettling atmosphere out of a mundane situation while breathing life into his characters. The key reason his follow-up to Get Out works is because he didn’t feel the need to repeat himself. It’s a film that certainly has some kind of message to it, but it’s not as obvious as the one driving Get Out. As a result, Us is what the film industry desperately needed in the late 2010s. It’s a work with rich symbolism and deeper meanings for those willing to scratch beneath the surface, yet the story is allowed to stand on its own. Whether you’re a horror fan or not, Us is without a doubt worth experiencing for yourself. I loved Get Out when a friend recommended it to me, and I’ve been meaning to get around to this one! Thanks for the recommendation! Get Out was great. I’m not sure if I would consider Us better, but it is easily in the same league. Hope you like it! I’ve been hearing so many things about this movie from friends, folks on social media, and now here. I absolutely loved Get Out, and I’ve been making attempts to see this but haven’t had the chance to. You make a lot of great points that make me really anxious to try to get to the theater to see this before it heads to home media. I may have more to say on it once I get to see it but in the meantime, awesome overview! It’s difficult to separate the hype from the quality of the film (especially when A24 is involved), but Us is the real deal. 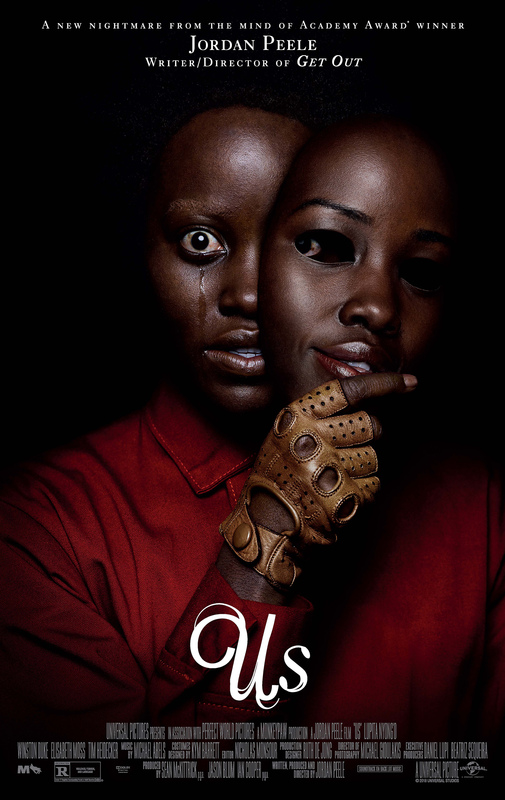 This is easily the best film of 2019 so far and when I eventually draft a top 10 list, it will make the cut unless Mr. Peele’s peers really step up their game (and even if they do, it would still have a good shot of making it). It would be just fine watching it at home, but getting to see it in a theater was quite a treat. Hope you end up liking it! This synopsis was great! I normally don’t read them until after the movie has come out, but the big exception to that rule is a horror movie. (I’m a chicken.) I definitely want to check this out! Definitely do so; I have little doubt it will make my top 10 list. Hope you enjoy! Some would argue that the police being useless is realistic. Hopefully this director can keep producing good horror, as the genre needs creative people. Even if one could make the argument that there’s a ring of truth to that insinuation, it’s still a really overused cliché that ends up stretching the suspension of disbelief. As such, I admire it whenever the writers can come up with a solid justification for using it like Mr. Peele did here. Here’s hoping he can keep up that momentum.